May 2011 is not going to be a good month for the beautiful and intelligent pilot whales of Japan. On May 4th 75 helpless pilot whales were driven into the cove. For two days activists have followed the sad news brought to us by the Cove Guardians. Brian Barnes, Scott West, and his daughter Alora, known to many of us as, “A Teenage Activist” kept the Facebook Community up to date. Most of us have been waiting, and checking minute by minute for updates on the pilot whale massacre. As the horrific slaughter unfolded many of us networked feverishly to spread the word that the blood cove was up and running. Ironically The Japanese news site, “Inside Japan”, published and article On May 4th, “Taiji Coastal Whaling Season Cancelled”. The article goes onto say that for the first time in 23 years the hunt has been cancelled. That article came out hours after the pilot whales had been driven into the cove. They had already been trapped in the netted areas. Scott West’s pictures show them huddled together, bobbing up and down anxiously watching the dolphin molesters as they set up their tarps. The blood cove is well named as pictured in the past two days. The water bright red. The pilot whales watched as their parents, aunts and uncles, entire community was lead in groups of six behind the tarps. 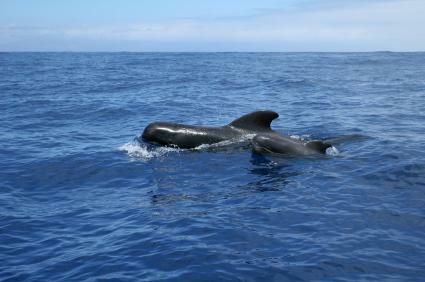 The pilot whales could be seen nervously swimming in the bloody water. The dolphin molesters dragged the paralyzed, dying whales up a boat ramp to their house of horrors. The remaining whales were forced to spend the entire night waiting to be led behind the tarp. Scott West released a picture this morning of a dead baby being lifted out of netted enclosure. He simply could not make it. The day went on with more terrible killing. The teen age activist, and Scott West have kept us updated all day thanks to Scott West’s on the scene reporting. Many of us are bloggers and have tried to post action alerts as the situation changed. The Teen Age Activist posted a list of embassies. This morning the phone calls went out. Into the afternoon we were all updated. The dolphin molesters had opened some of the nets. They were not going to massacre the juveniles or rather children. The children waited in the nets confused. How could they leave their loved ones behind? How will they survive? According to the Cove Guardians their chances are not good. Imagine a 5 year old shoved out into the street after watching his parents brutally murdered. How would they survive? The final entry tonight, “he whales have broken into groups. The banger boats are having trouble moving them out to sea.”(A Teen Age Activist, FB, May 5, 2011). http://mdn.mainichi.jp/mdnnews/news/20110506p2g00m0dm002000c.html . This article describes the death of this beautiful pod only in their worth on the market, “With the permission of the Wakayama prefectural government, local fisherman caught about 60 long-finned pilot whales, a member of the dolphin family, on Wednesday and auctioned them off on Thursday morning.” The article also gives us a number, 200 pilot whales slated for death. The entire month of May the cove will run red with the blood of innocents. For two days we have watched a pod, community of gentle sentient beings, who have a culture and dialect coldly and brutally violated. The photos were reminicint of the pictures we see of Auschwitz. You can’t help but think of the gas chambers the Nazi’s sent the Jews into when you see the blue tarps with the blood flowing from underneath them. The pilot whales were literally lined up and then led to their deaths. “The government of Japan should immediately pass laws to protect dolphins, porpoises and whales in their waters. By doing so, they would be sending the world a message of compassion. These groups are making a difference and if we take action we too can make things happen by joining our voices and letting the Japanese 26 Japanese fisherman know 23 years of terror is long enough. It is time for the cove to be a place of peace again, not death. This entry was posted in Cetaceans and tagged dolphin hunt, dolphin slaughter 2011, Japan, pilot whales, taiji by Kirsten Massebeau. Bookmark the permalink. What terrible news that Taiji is extending it’s hunt until the end of May! We need to keep networking and not drop the ball on this one. Please support our Sea Shepherds, they have ships they can make it happen. My heart goes out to the juvenile pilot whales wandering the ocean without their parents. A very sad two days. The fact that they have only been doing the dolphin hunt for 23 years is pathetic! And only 26 fisherman. Shame on you Japan! !